Engineers have attached the first fuselage barrels for the first two Boeing 777-9s—the static test airframe and the first flight test example—and moved them into systems installation, the company reported late last month, and the first pair of wings have emerged from the horizontal build line (HBL) at the company’s widebody plant in Everett, Washington. 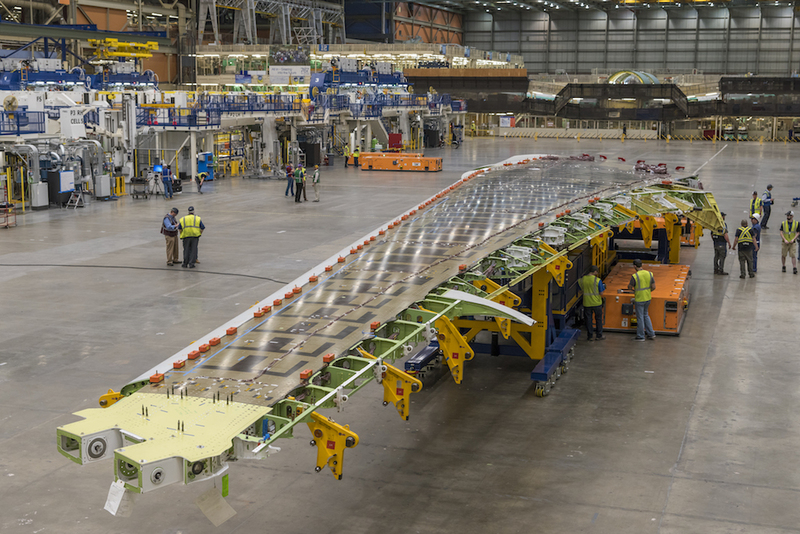 Scheduled to complete the static test airframe by the end of the year, Boeing has moved the wings for the larger of the two 777X variants into laydown and systems installation, while at the 1.3-million-sq-ft composite wing center (CWC), the company has now begun fabricating wings for the fifth airplane. So far, Boeing has sent four sets of wings out of the CWC and into spar assembly. The company has now completed 98 percent of its engineering releases, leaving “very few left to do,” according to a company spokeswoman, who reported the remainder involves mainly systems. In the factory, Boeing has completed the static test rig in Everett, and now is loading it with all its test equipment, while the fatigue test rig has reached the halfway point of construction. Meanwhile, the airplane’s folding wingtips have arrived from their production site in St. Louis for the static airplane and the first flight-test article. One of the airplane’s most visually distinguishing characteristics, the 12-foot-long folding wingtip will allow regulators to classify both airplanes as Code E, meaning they’ll fit into the same size parking space the 777-300ER now uses. The Airbus A380, conversely, operates as a Code F airplane, significantly limiting the number of airports it can use. In Everett, Boeing has begun construction of the second autoclave, scheduled to move into the CWC “later this year.” Now housing a single autoclave, the CWC will eventually need three to reach full rate. For spar production, Boeing has erected two fabrication cells, allowing it to build a front and rear spar simultaneously. While the CWC also makes composite panels, skins, and stringers—86 of which go into each wing—the wing’s aluminum ribs are made in other Boeing facilities. At Boeing’s Seattle-area test facility, the company has completed more than 20 labs and has entered the lab-testing phase. One of the labs, called the integrated test vehicle (ITV), covers 12,000 sq ft and took about three years to complete. It tests all of the hydraulics and actuators, as well as folding wing operation, flaps, landing gear and various other items. Also in the test building sits what Boeing calls Airplane 0, which took 33 months to complete. It began testing avionics and systems integration in March. Covering 11,000 square feet, it includes all of the avionics boxes, 55 bays of equipment and 3,700 instrumented cables. During a visit of Boeing’s Seattle-area facilities in late June, the company showed reporters the program’s engineering cab, or E-cab, which simulates a 777X flight deck in a test environment. The E-cab, which began testing in April, contains all the hardware and controls that pilots will use in a real airplane, including the five 8.5-inch-by-11-inch displays used in the 787. The 777X displays, however, feature touchscreen controls. Other 787 elements include large-perspective primary flight displays, extending the view beyond the speed tape and altitude tape. In the E-cab, a pair of optional Flight Dynamics head-up displays (HUDs) feature synthetic runway information—something not available in the 787. The layout of the center-aisle stand and the overhead looks much like those of the 787, which engineers purposely designed to mimic the so-called “gold standard” of the 777-300ER. Now, designers have taken the technology developed for the 787 and are “backfilling” it to the 777X. Other features taken from the 787 include a GLS and integrated navigation performance scales. Meanwhile, engineers have simplified the center-aisle stand through multiple capabilities in its tuning control panel, which incorporates the functions of a weather radar head panel and a federated TCAS panel. Those functions also feature prominently in the 787. Overhead, designers aligned all of the panels and systems in the same configuration used in the 787 and 777-300ER. Of course, the 777X includes a wingtip autofold switch, which controls the system that allows the wings to fold on their own after landing. Featuring 105,000-pound-thrust GE9X turbofans and structural improvements to the fuselage that will allow for a 6,000-foot cabin altitude, the airplane remains well positioned to meet Boeing’s 2020 entry-into-service target, according to the company. The largest commercial engine ever developed, the GE9X features a front fan diameter of 134 inches, a composite fan case, and 16 carbon-fiber composite fan blades; a 27:1 pressure-ratio, 11-stage high-pressure compressor; a third-generation TAPS III combustor for high efficiency and low emissions; and CMC material in the combustor and turbine. For the fuselage, after much deliberation, Boeing chose to retain the aluminum design, while still incorporating not only a lower cabin altitude but also higher humidity levels and larger windows. Boeing’s familiarity with the legacy 777 allowed it to create an environment comparable to that passengers enjoy in the all-composite 787, according to the company.